There are a couple of ways you can eat donuts at their peak freshness. Stand outside your favorite donut shop ready for it to open, so you are first in line for donuts right out of the pan, or you could make them yourself. I am not sure everyone has the time or energy to wait for the open sign to light on the donut shop door. However, we can all experience freshly made donuts at home with a donut maker. Understanding and choosing wisely from the best mini donut makers is our goal here, so let’s take a look at the options and learn a little bit more about how to make one of everyone’s favorite yummy treats. What Makes Fresh Donuts So Special? A donut, like a bagel, goes stale very quickly. The donut trade talks about the half-life of a donut. During the first hour or so it has a crisp outside and a soft inside, no matter if it‘s a leavened crumb of a cake donut or the more chewy yeast donut. In the first few minutes out of the pan, they can taste even better. It doesn’t take that long for the crispiness of the outside to soften, and the crumb to become a little stale. It’s still good to eat but just not perfect. The best donut shops virtually cook to order and don’t have many laying around to go stale. That’s why if you want to eat a donut at peak perfection, it‘s best to make them yourself. We are aware everyone enjoys them but how do we spell them, is it doughnut, or donut? The official dictionary spelling is a doughnut, with donut being a variation. The word doughnut makes its first appearance in the early 1800s describing a delicacy of sweetened dough fried in hog’s fat and made in New York. Even so, it took another 100 years before the simplified spelling of donut became popular in the United States. Once the successful Dunkin’ Donuts chain started in the 1950s, the use of the word donut took off. You would think that there is an ocean between the British English spelling of doughnut and the American English spelling of donut. Unfortunately, things get cloudy when you realize the first Friday in June is commemorated in the United States as National Doughnut Day – I kid you not! Therefore, for this review, we will be using both, but for the sake of consistency, I’m going to stick to a donut for our American readers. What Types of Donuts Are There? There are two styles of our most favorite donuts. There is the cake donut and the yeast donut. A hint at how you make a cake donut comes in the name. It is a bit like making a cake and uses a similar mix. Some bakers say it is about the same mix you would use for a coffee cake; flour, sugar, baking powder, baking soda, salt, eggs, butter, and a liquid, which for donuts buttermilk is preferred. What you get is a very thick and sticky dough that needs to be chilled before cooking. The yeast donut, as you would probably expect, fluffs up when cooked. This recipe calls for flour and eggs, butter, the yeast of course, and warm milk. Donut making experts say high quality butter will enhance the recipe, but the other ingredients can come straight from the larder. Of course, with any mixture involving yeast, it needs time to work or prove, so this dough has to stand in a warm place until it‘s grown twice its size before cooking. Mini donut makers are seen as simple kitchen appliances. None of the machines we have looked at comes with an on/off switch, so to turn off the plug must be removed from the electrical socket. Most have some indicator light to show they are powered, and therefore the heating elements are operating. Some have a light to tell you when they are ready to cook; others say when things are done. All have non-stick surfaces for easy cleaning, and some have removable heating plates. Most have some element of cool-touch, either on the handle or on the whole body of the machine. Some also have a locking mechanism when the two halves of the device are closed to begin the cooking process. These best mini donut makers can cook a batch of six or seven donuts at a time. The biggest clam-shell style machines can do a dozen. You will know what size suits your family the best. 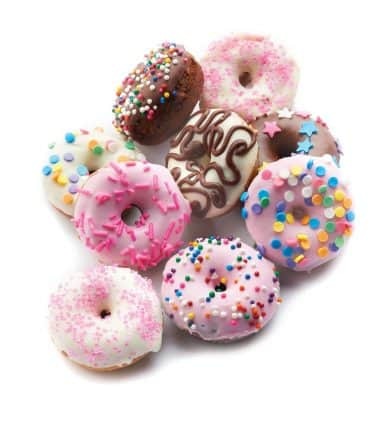 All of the mini donut makers we have looked at come in bright, vibrant colors, so you may want to pick a machine which best goes with your kitchen decor. You could never miss this mini donut maker in any kitchen; the bright yellow certainly stands out. And the Babycakes Nonstick Donut Maker also stands out for the quality of the donuts it produces, perfectly cooked and even ever time. The machine takes about three minutes to heat up, and then about a minute to cook six mini donuts, which is pretty fast. The nice thing with this donut maker, it comes with a special fork to remove to cook donuts from the machine, so your hands don't get burned, along with a wire cooling rack to let those tempting treats reach mouthwatering temperature. Other safety features are cool-touch handles, a locking lid, and rubber feet that are non-skid. Although the non-stick surface means it's easy to clean after cooking, the heating plates themselves cannot be removed for cleaning, which some might see as a drawback. If you don't want to disappoint your family with under or over baked donuts, then this is the donut maker to choose. The Bella Cucina 13466 has often been described as one of the most consistent donut makers around. It is very easy to use, and with the non-stick coating on the removable heating pans just as simple to clean. With the round shape, you can make seven mini donuts in a batch. Like a lot of machines, we have looked at the Bella Cucina takes just three minutes to heat up, and between two and three minutes to turn out deliciously fluffy donuts. The controls are straightforward and easy to follow, with a light to show you it is powered, and another to tell you when it is hot enough to start cooking. The machine comes with a recipe book for those who want to adventure into donut heaven. When it comes to ease operation, the Smart Planet MDM-1 Mini Donut Maker has everything you need. Simple controls and performance to match is a great combination making perfectly cooked donuts every time. With a non-stick coating for easy cleaning, this machine turns out six donuts at a time, cooking them in less than four minutes. When you and your family get the craving for donuts, and can't face a trip to the shops, then the Nostalgia Mini Donut Factory might be just what you need. This is a production line version of the traditional donut maker. As the name suggests it is just like a mini factory, put the dough in one end, and fresh and scrumptious donuts come out the other. This really is the big bad boy of donut makers, with the ability to make 30 in a batch. It is just like having the donut shop in your kitchen. As an added bonus the machine has a glazed window so you can see the whole process. Once everything us up to speed the Nostalgia MDF200 churns out a delicious mini donut every 90 seconds. 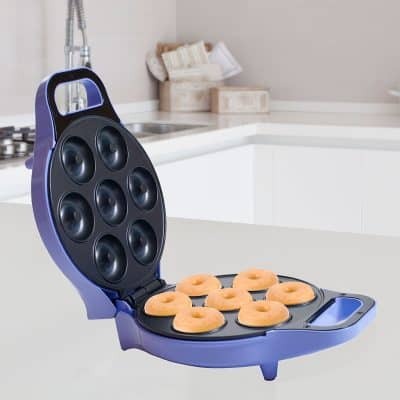 Of all the best mini donut makers we are looking at this is the only one with the unique ability to work upside down. The flip-over feature means it can be picked up and turned in the middle of the cooking process to make sure the donuts are consistent. Needless to say, with that feature the handle of the machine is insulated with cool-touch technology. The non-stick surfaces of the Chef Buddy's Hot Doughnut Maker heat up in only three minutes and have the seven mini donuts cooked in under two minutes. There are two lights on the machine, on to tell you when it has reached the right temperature, and the other when the donuts are done. Although this is one of the smaller mini donut makers out there, it still packs a great punch by speedily producing seven donuts in a batch. With a 750W heating element, it takes no time to warm up to the right temperature. The two indicator lights on the outside of the donut maker body tell you when it is powered up, and when it is preheating. With all that power, there's no worry about the outside of the machine getting too hot, as the donut maker uses cool-touch technology on the handle and the housing. So, once you've scooped in the donut batter and closed the lid, your seven delicious mini donuts will be ready in about two minutes. Because the baking tray has a non-stick surface, it is easy to clean once you've finished cooking up your favorite treats. With an integrated wrap for the power cord, the Brentwood TS-250 takes up very little space in your storage cupboard when not in use - but with the quality of the donuts, it is unlikely this machine will see much downtime. If you are a fan of donuts with your coffee for breakfast and need something fast and convenient early in the morning, then the Betty Croker BC-2938CO fits the bill. This is one of the fastest donut makers on the market. With a heat up time of around two minutes and a cooking time of about one, you'll have your donuts ready before the coffee is brewed. The Betty Crocker brand has a tradition of safe and reliable appliances, and this donut maker is no exception. The cool-touch handles make it easy to move around, and the non-skid rubber feet mean it's not going to sit steadily on the kitchen top. The brand extends a one-year warranty to the product along with technical support should anything go wrong. The device also comes with a spatula and decorative icing kit. If you are thinking of making donuts for your next children's party, and cannot face hours churning out a handful at a time, then look no further than the Tasty Treats Donut Maker. Unlike other donut makers, this machine cooks 12 at a time, almost double the amount most other machines produce. to heat up and will cook the batch of a dozen in around about a minute. On the outside, there is an indicator light that tells you when the temperature is right, and it is ready to start cooking. The Tasty Treats machine has the added safety features of a locking lid and rubber feet, so it will not skid around your kitchen top. This model from Sunbeam offers two treats in one, apart from making delicious donuts, it can also be used for baking brownies with the extra pair of cooking plates provided. The interchangeable molds are non-stick coated so cleaning could not be easier, and because they can be removed they can be slipped into the dishwasher too. The machine can cook six donuts or brownies at a time, and it usually takes about five minutes for the donuts to be cooked to perfection. A set of mini traffic lights on the lid of donut maker say when it is powered up and ready to cook, and the other when the batch is done. The lid locks in place for added safety and the non-skid rubber feet make sure it's stable on the kitchen worktop. The handles are cool-touch, so you don't have to worry about burning yourself when opening and closing the donut maker. This machine will add color as well as great taste to your donut making. The Holstein Housewares comes in a couple of vibrant colors, magenta, and teal, bright enough to add sparkle to any kitchen. The HF-09004 is similar to most of the donut makers we have been looking at with a heating up time of about three minutes, and a cooking time of around two. In addition, the cooking surfaces are non-stick, although they are not removable for cleaning. It also has all the safety features you would come to expect from such a simple home appliance. There are cool-touch handles, non-skid rubber feet, and the lid locks, and it can be placed upright when not in use for easy storage. Why Buy A Donut Maker? Traditionally donuts are a fried food. The batter is popped into hot oil to cook until golden brown and then dusted with a little sugar ready to be devoured. Easy you say, well not so as there are so many things that can go wrong. Let me explain. You always need to be careful frying with hot oil. The last thing you want is it spurting all over your stovetop. Donuts need deep oil, and generally can’t be cooked in a shallow pan. So you need a deep pan with at least a quart of oil to successfully fry donuts. Remember popping the donuts into the pot means the oil will be displaced, so the pan needs to hold at least two quarts to stop any excess oil spilling over the top. Getting the temperature of the oil right is imperative to cooking fluffy and delicious donuts. Chefs who have been frying donuts for decades will tell you that a thermometer is vital to make sure the oil is at just the right temperature. A candy thermometer or one designed for deep frying is best. If you don’t adjust the temperature of the oil while cooking, your donuts could be undercooked. When frying, the temperature of the oil will fluctuate, so it‘s important to try and keep it as constant as possible. So, once the donuts are popped into the pan, its best to raise the stove’s heat just a little to compensate. Alternatively, when you take the donuts out, best to turn the heat on the stove down a little, otherwise the temperature of the oil may climb dramatically. If you want your donuts to be beautiful and golden brown and crisp on the outside, and perfectly fluffy inside then you have to make sure the temperature of the oil is high enough. Most cooks recommend a narrow range cooking temperature of between 350F and 360F for best results. Lower than this and your donuts will come out greasy and doughy and chewy. And finally, if the donut is not properly drained of oil, then it really can be an oily mess. It’s best to use a slotted spoon when removing the cooked donuts from the pan, and allow the baked donuts to drain with a little gentle agitation, before putting them on a cooling rack with kitchen paper to catch the remainder of the excess oil. So you see, what appears to be the simple frying of donuts, is fraught with problems, and is often why lots of people shy away from making donuts at home. However, by using a donut maker, all those critical issues are resolved, and you can have fresh delicious and more healthy donuts every day if you love them as much as I do. Donut makers are not deep fat fryers, so there are fewer calories in the donuts, and a lot less mess to clean up afterward. Having a healthy looking body is a top-10 on almost everyone’s wish list, but it isn’t easy, especially when it comes to changing your diet. No one wants to give up dessert or sugary snacks. Since donuts are essentially dessert for breakfast, they’re often the first to face the chopping block. Recent studies show that sugar may be as addictive as some popular drugs, and we depend on that sweet flavor psychologically. With this in mind, moving on to healthier alternatives is important for both your physical and mental health. The good news is, you don’t have to chop dessert off the end of your menu. You can even have donuts for breakfast. It’s all about getting smarter about what you put into them. We’ve gone over some of the easiest and most creative ways to cut calories and add nutrition to your favorite breakfast food. Whether you want a slight change to help you start the process, or you’re looking to reinvent the wheel, you’ll find the ingredients you need below. This is the simple alternative for someone looking to cut just a few calories without changing the flavor and texture of their favorite donut recipe. While whole wheat flour is better than bleached white flour, it doesn’t add much besides fiber to your donuts. It doesn’t cut anywhere near as many calories as advertising would lead you to believe, either. Still, it’s a great step in the right direction, and it may open the door to further experimentation. Everyone knows that olive oil is a healthier stove-cooking option. Unfortunately, it’s not great for high temperatures. In fact, high temperatures turn olive oil’s health benefits into potentially harmful chemicals. That leaves things like frying, particularly deep frying, out of olive oil’s range. Still, butter and frying oil make up two of the worst ingredients in any donut recipe. Coconut oil is touted as everything from a lotion to health supplement these days, but not all the hype is false. This oil acts just like butter, which makes it perfect for cooking at high temperatures without compromising its cellular structure. It has fewer of butter’s drawbacks, and because it isn’t a dairy product, it’s appropriate for a wider range of diets. Coconut oil can replace butter in donut batter, and it can be used to fry the donuts, too. This cuts out two less healthy options with a single, healthier ingredient. Thanks to nutritional movements like the Paleo diet coming into vogue, a lot of cooks and bakers have been re-examining the foundations of their donuts. This brought chia and flaxseed meal into the limelight. They’re both nutritious options. Besides cutting sugar and calories, they actually deliver powerful vitamins, minerals, and fiber to your food. It’s possible to cook tasty treats without wheat flour at all, but if you substitute flour with chia of flaxseed meal entirely, you’ll get a very unusual texture. That said, there are plenty of recipes that use a mix of flours and seed meals. Together, they give you the texture and nutrition you’re looking for. You’re bound to find the right combination for your taste buds with a little experimentation, and that gives you an excuse to make more donuts! Blueberry cake donuts hold a place in the donut hall of fame, and it’s all thanks to the fruit. One of the simplest ways to avoid unhealthy, artificial flavors and extremely high sugar content is to use fruit, nature’s sweets, in your baking. Berries are some of the healthiest, most nutritious foods in the world, so feel free to add liberal handfuls of blueberries, raspberries, and others to your donuts. The flavor helps you cut back on the sugar you add to the batter, and the fruit itself gives your sweet indulgence more than empty calories. Blueberries are called a super food for a reason. Even if you aren’t a fan of big chunks of fruit in your baked goods, you have options. Pulverizing fruit in a blender or food processor allows you to get the most out of the flavor without overriding the donut’s texture. Blended fruit will fold into batter very well. As an extra benefit, the grinding frees the fruit juice, which mixes with your batter’s other liquids to infuse the entire batch. This trick works for any kind of fruit, including bananas, oranges, and even apples. The worst part of any sweet is its sugar content. While we suggested adding some sweet flavor with fruit, we understand that apples and berries alone do not satisfy the primal urge of the sweet tooth. Processed sugars, however, are the absolute worst option for anyone to use in their cooking. Agave nectar, maple syrup, honey, applesauce, and monk fruit sweeteners are all options for those trying to get away from processed sugar. Although things like maple syrup and applesauce are relatively processed, they are still far closer to their natural forms than cane or beet sugar. They also rely on additional flavors besides pure sweetness to make them tasty. In the case of applesauce, you get bonus fiber to boot. Finding the right balance of these ingredients depends on your individual taste and health requirements. You may already face the need to completely remove processed sugar from your diet, or you could be dealing with a wheat allergy. These factors will ultimately decide which techniques and ingredients work best for you as you pore over the best mini donut makers in hopes of adding a little indulgence to your kitchen cooking . Just remember, even if your donut doesn’t look like something from the store, homemade donuts rarely do. Just because it looks different, doesn’t mean it’s wrong. It certainly doesn’t mean it tastes bad, either. Recipes are always a matter of experimentation, so try different fruits, sample different sweeteners, and see how chia or flaxseed meal affects your results. Changing your diet is uncomfortable, but it shouldn’t be a tasteless experience. Once you’ve retrained your body to taste things other than pure sugar, you’ll be amazed at how many different flavors there are in the world. What do I want a donut maker for? Let’s assume you have a sweet tooth and like to eat donuts. Visiting the local coffee shop each day and picking up a donut can become very expensive. Just add up how much you spend on a donut if you buy one every day to go with your morning coffee, it could be as much as $250 a year. For the price of say five donuts you could buy the ingredients to make donuts for the whole family for a week or more, so everyone can enjoy them, not just you. A reliable mini donut maker will pay for itself within a month or two, and you have the reassurance of knowing exactly what ingredients have been used to make your donut. By using a donut maker, rather than a store bought fried donut it will be healthier too. Homemade donuts have less cholesterol than store bought, and you can also experiment with recipes to find the one that is perfect for your taste buds. When you buy from a donut store, you have little idea how long it has been sitting on the shelf, whereas when you make your own at home, you know they are fresh as fresh can be. You also have control over the recipe, making sure all the ingredients are of the highest quality and excluding anything you don’t like or that may cause an allergic reaction. What are the best mini donut makers for you? It’s best to answer this question by deciding on the quantity of donuts you want to cook. Is it just for yourself, or for a family of multiple hungry kids? And if you will need lots of donuts you would want to spend as little time preparing them, so you have more time to enjoy them. Therefore, the time it takes to make a batch needs to be considered too. We have reviewed a selection of the best mini donut makers in this article, so there is likely to be one that is just right for you. How do I get the mixture in the cooking cups? Most people try spooning the donut mixture into the machine, but you need to be very careful not spilling it all over the heating element and making a mess. Users recommend two simple ways of cutting down on mess and making things a whole lot easier. You could first try piping the mixture into the cooking cups of the machine. With this method, you have more control over the amount of mixture you put in each cup. You could also try using an ice cream scoop to ladle up a quantity of the mix, and put it in each cup. Both of these have been tried and tested and work great. My donuts are raw in the middle, what did I do wrong? There are a couple of reasons why this could be happening. The first is that the batter may be too cold and that the heat does not get through to the core of the donut to cook it before the outside is ready. We are talking very quick cooking times, so it‘s best to have the dough at around 70F/23C for best results. Secondly, the cooking time might be off, and the donut needs more time in the machine. As all devices are different, it‘s best to check the manufacturer‘s recommendations, and if still unsuccessful, experiment with longer or shorter cooking times. The inside of my donut ring cracks, where am I going wrong? Quite often this is a problem due to the batter being too stiff. The mix of water or buttermilk to the other ingredients may be a little off, so best to check with the recipe, and alter accordingly. Practice makes perfect. My donuts don’t seem to rise, what’s the problem? This could be due to lots of reasons. The most likely is that the donut batter is not mixed enough. Check the recipe, and experiment to make sure you are getting the ingredients properly mixed and have aerated the mixture for the correct length of time. It could also be due to the consistency of the batter not being right. Again, check the recipe, and try again. It’s also wise to keep an eye on the batter temperature and the cooking temperature to make sure they are correct and not too low thus hindering the batter’s rise.